Think back to the last time you had to check-in somewhere. Perhaps it was this morning when you arrived at a meeting, your last visit to the doctor, or in a hotel the last time you traveled. Regardless of when or where you last checked in, when you reflect back on your experience, does anything about it stand out or was it simply another waiting game? Odds are, you probably endured a waiting game. 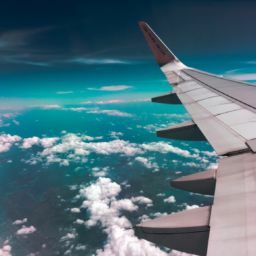 Though the check-in process is one that consumers go through on a regular basis, it is also one that is typically associated with delayed service and long lines. This association has emerged as especially problematic as consumers have begun living busier lives and placing higher value on their time and the quality of the service they receive. Check-in kiosks aim to eliminate some of these woes and to provide a more enjoyable experience for customers by streamlining processes, decreasing wait times, and allowing customers to complete the task at hand at their own convenience. Best of all check-in kiosks can be used to increase efficiency and customer satisfaction across a variety of industries—from hospitality, to healthcare, to a corporate workplace. The hotel check-in desk is usually one of the first stops visitors make when arriving in a new city. Often tired from their journey and burdened with luggage, getting their room key and unpacking is usually a high priority for guests. Hospitality check-in kiosks, strategically placed throughout a hotel’s lobby, make it simple—guests can simply enter their reservation information, provide a credit or debit card for payment, and retrieve their room key from the dispenser. By using this process, guests are able to expedite and simplify the check-in process. Similarly, hotel employees who would have previously been tasked with the check-in process, are now available to serve a more customer service-oriented role—answering questions, providing directions, and further enhancing the guest experience. Naturally, they can also be available to help guests with the kiosk check-in process as well, if necessary. Another added perk of hotel check-in kiosks is that they’re available 24/7. Regardless of how late into the night they arrive, guests are able to complete the check-in process and retrieve their keys in a matter of minutes. Similar to when first arriving at a hotel, when arriving at a medical appointment the first thing a patient does is check in. Often comprised of completing and updating paperwork this process is one that can also be quite timely. Healthcare check-in kiosks can be used to simplify and expedite the process. Patients are able to check-in upon arrival, enter and update their personal health information and medical records, scan their insurance card, and even schedule their next appointment, all from the kiosk. In addition to their time-saving capabilities, healthcare check-in solutions are highly versatile and able to successfully improve the check-in process in the small private practice to large hospital systems. With the ability to seamlessly tie into any healthcare facility’s back office system electronic medical records system, both patients and healthcare providers will be able to more easily, and securely, access the medical and charting information they need, regardless of their location throughout the facility. Checking-in to an office building or corporate campus where you’ve never been before can be somewhat overwhelming—after all, you’re probably arriving for an important meeting or interview and you’re nervous enough as it is without having to worry about finding the specific office or meeting room where you’re supposed to go. Corporate check-in and wayfinding kiosks tackle the check-in worries with ease. 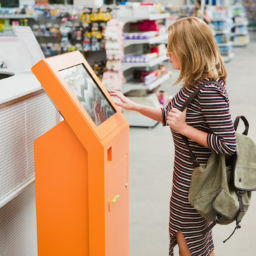 Not only does the kiosk provide a platform on which visitors can enter their information and indicate the party they are visiting, it can also be designed to incorporate a camera and printer to produce visitor badges, and provide wayfinding instructions to lead visitors to their desired destination. 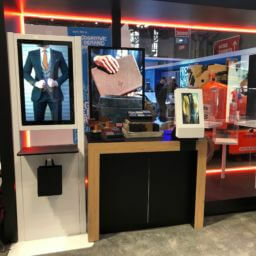 Additionally, corporate check-in kiosks can incorporate badge scanners and other peripherals for internal use for companies who require their employees to check-in on a regular basis. As consumers continue to live increasingly busy lives, time-saving measures like check-in kiosks are becoming increasingly valuable. While there’s certainly no denying the important customer service role that front-of-house staff play—and will continue to play—in the visitor, patient, and customer experience, check-in kiosks are finding ways to improve efficiency across the board. 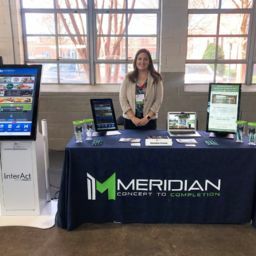 To learn more about Meridian’s check-in kiosks, visit www.meridiankiosks.com.